For best results defrost scallops prior to use.. Wash hands, all surfaces and utenstils after touching raw shellfish. 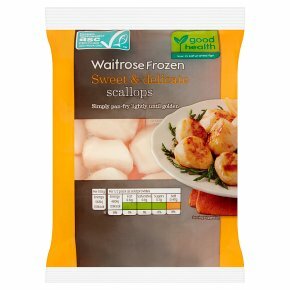 For best results defrost scallops prior to use. Pan Fry. Chilled: 3 - 4 mins. Medium to High Heat. Remove all packaging. Heat ½ tbsp of vegetable oil in a frying pan, add scallops and pan fry over a medium to high heat, turning occasionally. Do not reheat once cooled.